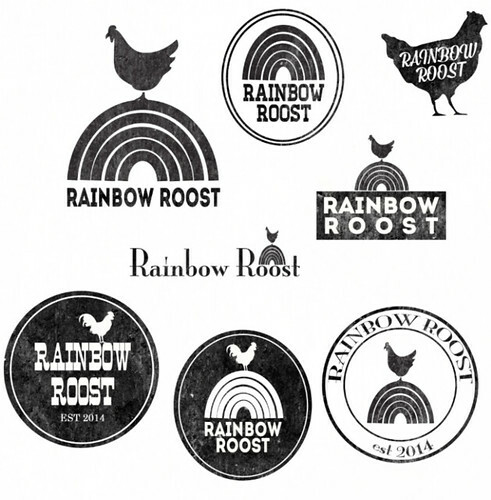 I have been working on a logo for our eggs once the chickens started laying, and I feel like I have narrowed it down. 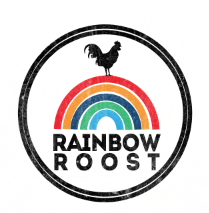 We are calling our chicken farm the Rainbow Roost. We are supposed to be getting around an egg a day per chicken, so we should have tons to give away. So far we only have one chicken laying, but she lays one everyday. And then crows or screams (or whatever a chicken does) so loud to tell me that she laid one. And we both liked it in color. I still like black and white and feel like there will be a place for that, but I do like the color too. I also made an extended label that could lay out over an entire carton. Overall, I am pretty excited. If we use the plastic cartons we will use this, but if we do paper we will print them off with just the rainbow roost circle or I want to make some that wrap all the way around. I cant wait to actually see them on cartons! I just tried to comment, so I hope this doesn't show up twice! I love this so much. That was my favorite logo from the very first photo. I would literally (Chris Traeger voice) wear a shirt with that logo on it. Also, I genuinely don't know how to tell, but is that a rooster or a hen on the final decision? I vote hen, since it'll be on an egg carton. I LOVE THIS! 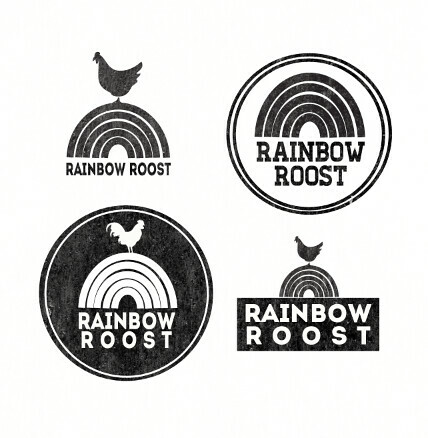 I think choosing a logo with a rainbow and in color is the best choice. I wish I had thought of this with our chickys! Although the heat has caused them to go on laying hiatus but I'm hoping they get themselves back in gear soon. Your friends and neighbors will LOVE getting farm fresh eggs! what a lovely idea! i'd buy some...if i were in your neck of the woods. the logo is perfect!